This entry was posted in Free sample puzzles, Sudoku Variants and tagged BOOK, EASY, free puzzle, free puzzles, INSANE, IQ, Merry Christmas, odd even, odd/even, solving technique, swordfish, technique. Bookmark the permalink. Post a comment or leave a trackback: Trackback URL. I solved this puzzle with only one XWING! After putting the pencil marks it took me no more than 10 minutes to solve it! I liked very much. Sorry, but I took one pencil mark only —and less than two minutes to solve it!!! A very very easy puzzle!!! Think the even/odd-Sudokus are the easiest Sudokus-variants and a little bit boring! And no chance to make them really harder, like Killers, Outside, etc. I took one pencil mark only —and less than two minutes to solve it!!! A very very easy puzzle!!! 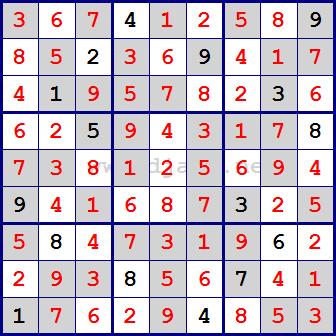 Think the even/odd-Sudokus are the easiest Sudokus-variants and a little bit boring! And no chance to make them really harder, like Killers, Outside, etc. What’s the matter… ? An “error” was shown to me… a server problem! No entrance possible…, but now I have the post twice?! Sorry!